It's easy to go overboard when you're hosting Thanksgiving dinner. Use these expert tips to plan ahead — and save. For the first time ever, I am hosting my family for Thanksgiving. And not only that, I am participating in a time-honored tradition of the newly engaged: bringing the families together. Yes, for the first time ever, my parents and brother will be meeting my fiance’s mother and sister over Thanksgiving dinner — in the tiny two-bedroom apartment where we live in New York City. As thrilled as I am to be hosting (and therefore not to have to deal with one of the busiest travel days of the year), I’ll be honest: I’m a little stressed out. Not because I think our families won’t get along — they’re all great people, it should be swell! — but because I’ve never cooked a holiday meal, let alone one featuring a meeting of future in-laws. And as much as I know they will all love the meal regardless, I’m starting to feel immense pressure to make sure it goes perfectly. I’m doing everything I can to make sure my home looks the part, that we plan ahead for the food and that everything goes as smoothly as possible the day of the feast. This seems like a no-brainer, but it’s something I could definitely miscalculate: planning the right amount of food for the people you’re hosting. Yield means what useable product you get after the bird is cooked down and ready to serve. [Assume you need] 8 ounces of protein per person. This is a lot, but who doesn’t overeat for Thanksgiving, and who doesn’t want leftovers? If you’re serving more than one protein (such as a ham and a turkey) obviously cut numbers in half, meaning 4 ounces of turkey and 4 ounces of ham...Assume a 50% yield on average. You’ll likely get a tad better, but this is a good estimate. So, for 10 people, being served 8 ounces each, you need 5 lbs. of yield. That would call for a 10-lb. turkey. Personally, I’d order 12 lbs. to be sure but, that’s me. Buying too much turkey isn’t the end of the world, especially if you can use the leftovers to make something delicious (my favorite is turning it into a shepherd’s pie). But over-buying also means you have a bigger chance of letting your turkey go to waste — and losing money because of it. Use Camac’s yield rule to make sure you get the right amount. While you may feel pressure to please everyone — as I certainly do — try to let that feeling go as much as possible. Plus, taking care of sides potluck-style means everyone has a better chance of eating their favorite sides, and you get to save money on food costs. Of course, if you’re like me and have family coming in from several states away, throwing a potluck Thanksgiving is easier said than done. But don’t try to bite off more than you can (literally) chew. Have you ever resorted to Chinese takeout the night before Thanksgiving? I certainly have — and now I know I’m definitely not alone. “I once read that pizza deliveries are the highest on the night before Thanksgiving,” says Lowe. To avoid becoming a part of that expensive statistic, she suggests building Wednesday night’s dinner into your Thanksgiving meal plan. Even if you’ll be too busy prepping to cook anything for that night, you can still avoid an expensive delivery meal. Personally, I’ll probably stick with the online-ordering option at Whole Foods, which my family has done for years to great success. If you want to do a little cost comparison beforehand, poke around the internet for testimonials on mail-order turkeys. Finally, even if you’ve never hosted your own Thanksgiving, you probably know you’ll forget something. To avoid this, Lowe suggests doing your actual shopping as early as you can. If there’s one thing I’ve taken away from all of this, it’s to plan ahead for everything. 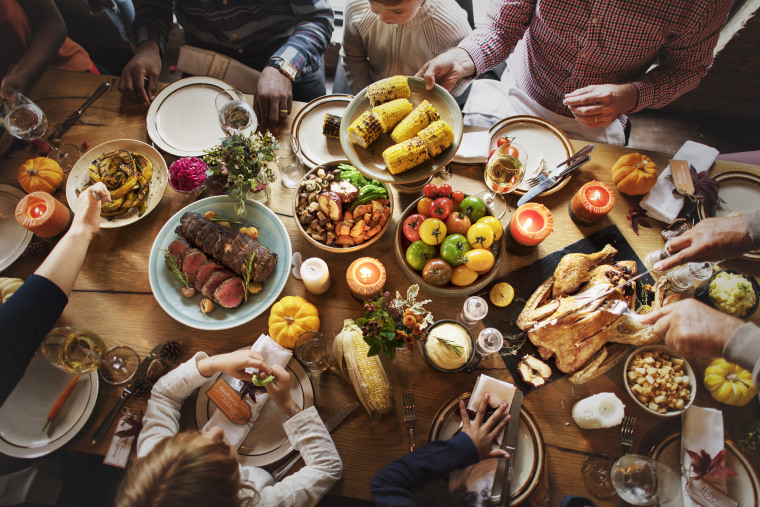 With these tips, I’m hopeful my first time hosting family for Thanksgiving will go wonderfully — and I’m sure yours will, too.